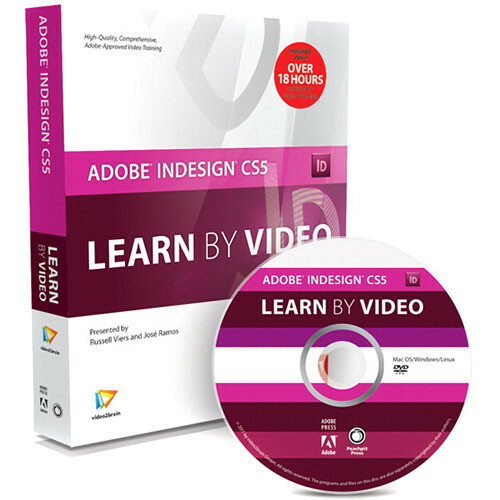 Peachpit Press presents Adobe InDesign CS5: Learn by Video an interactive video teaching the fundamentals and advanced lessons on how to use Adobe InDesign CS5 and some basic principles of publication design. With over 10 hours of video tutorials, instructors José Ramos and Russell Viers help viewers learn publication and print design strategies. The HD video lessons are further aided by the help of lesson files, review materials, and assessment quizzes. The unique video interface allows viewers to work and watch by shrinking the video size and providing room to work within InDesign CS5 alongside the lesson. Viewers can also bookmark specific lessons and jump between sections for a more personalized learning experience. Select video lessons are also available to download for mobile viewing. A 120-page booklet containing supplemental material is also included. Interactive video teaching the fundamentals and advanced lessons on how to use Adobe InDesign CS5 and some basic principles of print design. Learn print and publication design and techniques. Lesson files, assessment quizzes, and review materials included with video. Watch-and-work feature allows the viewer to watch the video in a small window while working alongside it. Select video lessons are also available to download for mobile viewing. 120-page booklet of supplemental material included. Box Dimensions (LxWxH) 9.0 x 7.3 x 1.2"